« How well do grad students grasp evolution? 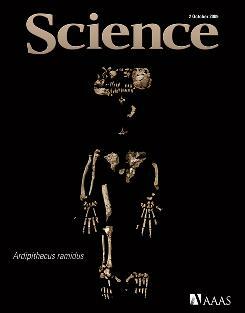 Tomorrow’s Science will be a special issue reporting tons of new information on the fossil hominid Ardipithecus ramidus (“Ardi”), which is really exciting (though not as much as Darwinius, which was “like a meteor hitting the Earth” or whatever). …and that chimps were an evolutionary offshoot of this creature. Nope. Neither humans nor chimps are offshoots of this creature, they are (if the phylogenetic assumption is correct) both descendants of a creature similar to this (but probably not this one per se). Otherwise it’s like arguing that your cousin is an offshoot of your grandmother and you’re not. So that could mean that while humans didn’t diverge much from their evolutionary ancestors, “chimps and gorillas look like really special evolutionary outcomes,” says Science study author Owen Lovejoy of Ohio’s Kent State University. Right. This would make many of the obvious traits of chimps derived rather than primitive, and many classically human traits primitive rather than derived. (It doesn’t really matter in one sense, because every species is a mixture of primitive and derived traits, but it sure would destroy those evolutionary lineups with chimps at one end and humans at the other). Chimpanzees may be our closest living relatives, but that doesn’t mean that our common ancestor with them looked precisely like a chimp. In fact, a lot of what makes a chimpanzee a chimpanzee evolved after our two lineages split roughly 7 million years ago. Ardipithecus offers strong evidence for the newness of chimps. Only after our ancestors branched off from chimpanzees, Lovejoy and his colleagues argue, did chimpanzee arms evolve the right shape for swinging through trees. Chimpanzee arms are also adapted for knuckle-walking, while Ardipithecus didn’t have the right anatomy to lean comfortably on their hands. Chimpanzees also have peculiar adaptations in their feet that make them particularly adept in trees. For example, they’re missing a bone found in monkeys and humans, which helps to stiffen our feet. The lack of this bone makes chimpanzee feet even more flexible in trees, but it also makes them worse at walking on the ground. Ardipithecus had that same foot bone we have. This pattern suggests that chimpanzees lost the bone after their split with our ancestors, becoming even better at tree-climbing. Chimpanzees do still tell us certain things about our ancestry. Our ancestors had chimp-sized brains. They were hairy like chimps and other apes. And like chimps, they didn’t wear jewelry or play the trumpet. But then again, humans turn out to be a good stand-in for the ancestors of chimpanzees in some ways–now that Ardipithecus has clambered finally into view. 2 comments to Humans vs. chimps — neither is an offshoot. Ardi's robust thumb musculature and flexible midcarpal (wrist) joint are perfect for text-messaging. It's not as bad as the Toronto Star article, which seemed to suggest that humans evolved from chimpanzees. Oh the humanity.